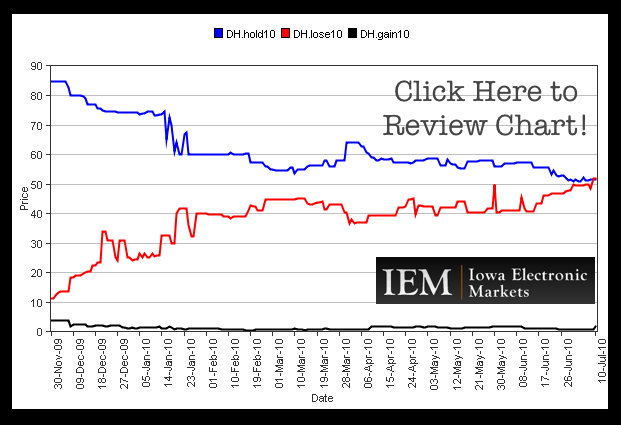 Iowa Electronic Markets: Who Will Win Control of the House in the 2010 Midterms? For many years, the Iowa Electronic Markets have served as a futures market for political and economic information. As we move to the fall, the race for control of the House (and in turn the Speakership) appears to hang in the balance. The plot above offers both the current spot price as well as historic information regarding the markets’ perspective on this important race. Click here for information regarding this specific market.